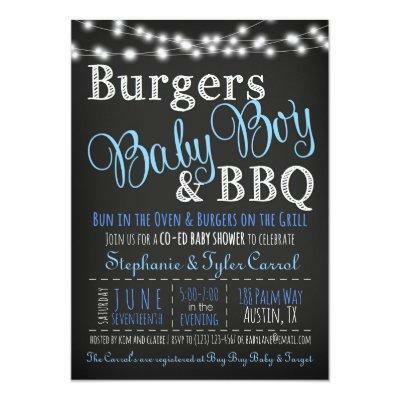 Burgers, Baby Boy and BBQ BaByQ Shower Invitations with a Book Card Back in chalkboard are editable. The top blue fonts are not changeable but the rest is. The back is an editable book card for your guests to bring a book for baby or leave it blank. These are perfect to celebrate your special day in a fun and unique way! > Click on my logo below or scroll through my Chalkboard BBQ Baby Shower collection for more items that match this theme. To include, Thank you Cards, Diaper Raffle Cards, Tags, Stickers and more!